Makes painting easier, cleaner and faster. Clings to most surfaces, speeding up prep time. Special coating attracts over spray, keeping uncovered areas cleaner. 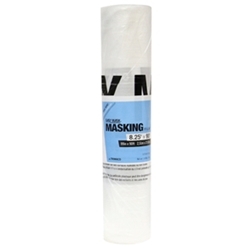 Works with tape applicators and maskers. Unfolds easily. Less expensive compared to 3M's masking roll. Can be purchased as a case of 12 rolls.